Have you ever tried cooking a Cornish hen? They are a fantastic smaller sized chicken that is perfect for pairing down portion sizes or when you’d like to trim back cooking time for cooking a whole bird. Since it is not your run-of-the-mill chicken dinner, an Asian Brined Cornish hen is a surefire way to impress the family! 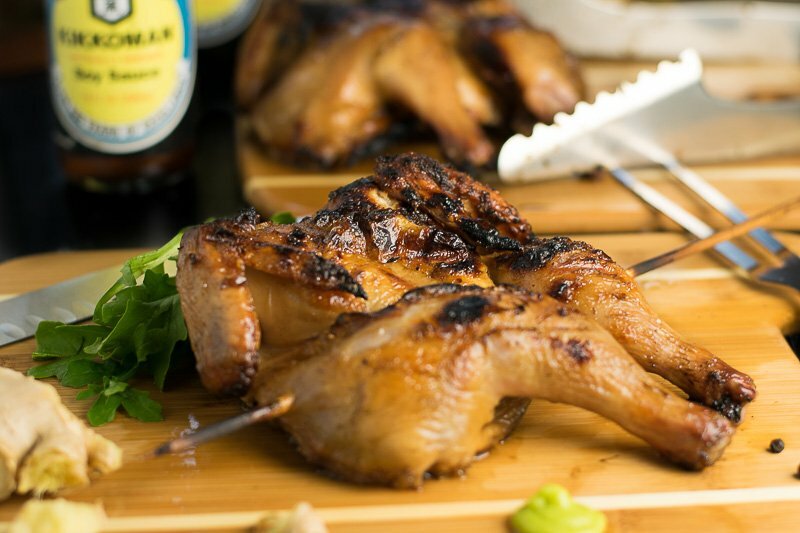 You can certainly make this recipe in the oven, but grilling will really make this bird sing! There is no sweeter music than the sound of poultry skin crisping over charcoal. Plus, the added flavor of meat roasting over charcoal cannot be replicated in the kitchen. 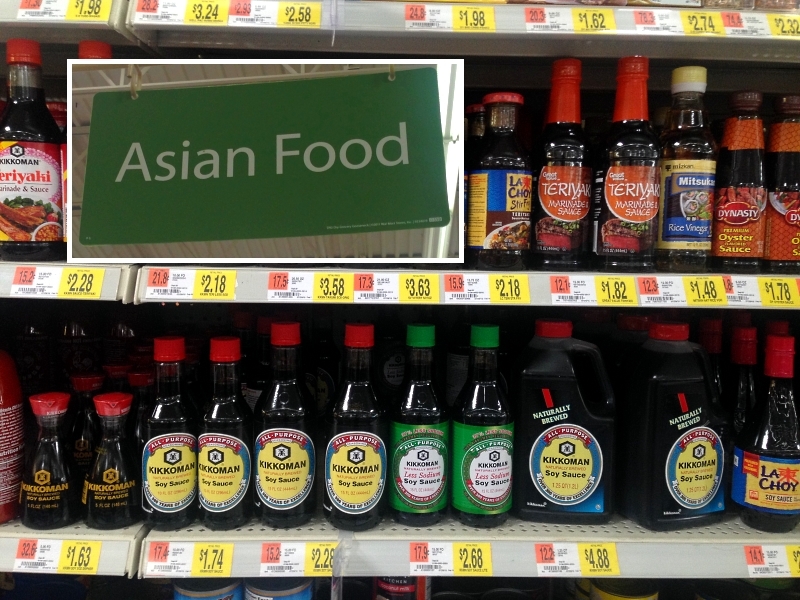 I grabbed Kikkoman® Soy Sauce at Walmart, which is essential for creating an Asian brine. 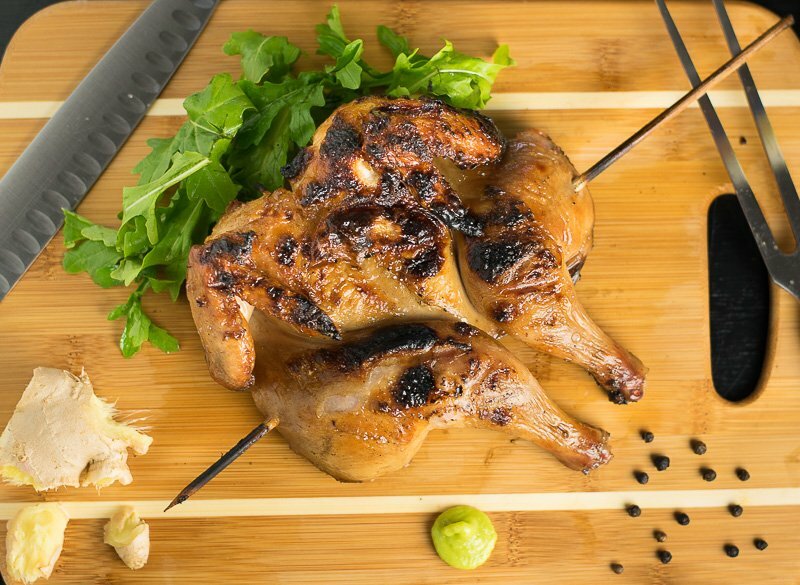 The salt content in Kikkoman® Soy Sauce makes it an ideal choice for brining, it will ensure you cook up a juicy bird infused with great Asian flavors! Walmart also carries Tyson® Cornish Hens. I like using them because they are 100% all natural, no artificial ingredients or preservatives, and no added hormones or steroids. That is important to me. Plus, my brother also works for Tyson, pulling racks of summer sausages at their New London location. I’m always excited to support companies that support my loved ones. If you have never brined meat before, it is a miraculous process that saturates the meat with flavor. By soaking the meat in a salty solution the meat will absorb the flavors of the brine and hold in a lot more juices while cooking. The end result is a juicier, more flavorful bird! 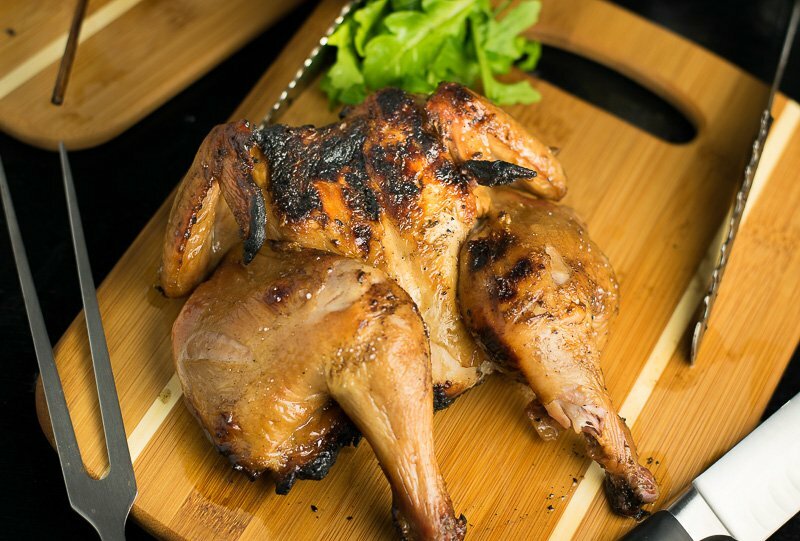 To grill a Cornish hen, I recommend the spatchcock method by which you cut out the backbone so you can lay the bird flat on the grill, as shown in the picture below. It allows for more even heat distribution. 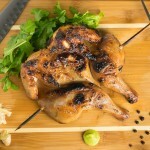 For more tips and tricks on grilling poultry, check out my write-up on grilling chicken over charcoal. Add all brine ingredients to a saucepan and boil for 10 minutes to allow sugar and salt to fully dissolve. Place brine in the fridge to cool. - These first steps can be done ahead. Cut out the backbone of each Cornish hen so they are able to lie flat. Place thawed Cornish hens in a gallon storage bag and pour in brine and ensure birds are fully submerged. Let the Cornish hens brine for 2 hours. Remove from bag, rinse under cold water and pat dry. Place hens on grate over hot charcoal, breast side up and let cook till the bottom begins to blacken. The time will vary depending on the heat of your coals. Flip so the breast side is down and let cook till the skin crisps and begin to blacken. Use a meat thermometer to check for doneness. If the meat has not reached 165 degrees move the birds away from direct heat so they can continue cooking without burning. Let rest 5 minutes and serve along with a dollop of wasabi. 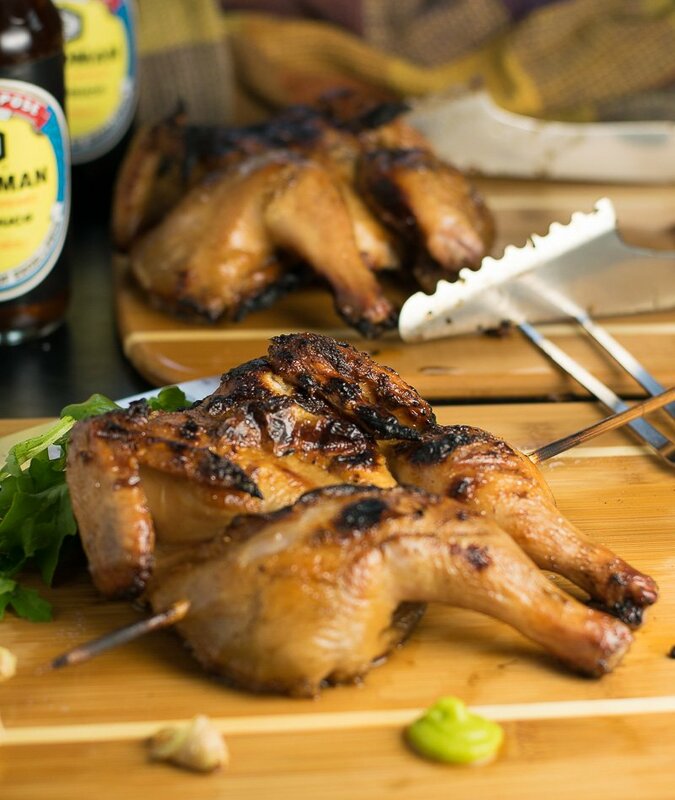 Be sure to check out Tyson and Kikkoman for more delicious ways to grill up great flavors before summer is gone! If you enjoyed reading my Asian Brined Cornish Hen recipe then you should probably like me on Facebook and follow me on Pinterest too. That’s what I would do at least, because if you don’t get to know me but you still use my recipe it is kind of like taking candy from a stranger, and your mom taught you not to do that. Don’t disobey your mom, subscribe to Fox Valley Foodie today.